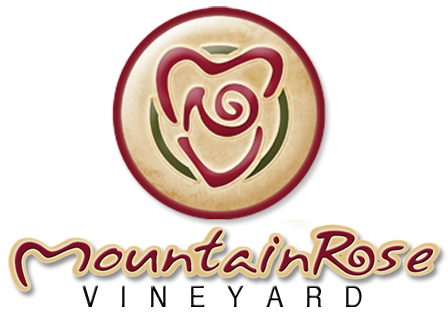 MountainRose Vineyards planted its first vines in 1996 with several varieties on the previously mined land.Eight varieties of grapes (white: Traminette, Riesling, Vidal Blanc, Seyval Blanc, Niagara, Rkatsiteli, and red: Chancellor, and Cabernet franc) now grow here. Another three acres of young vines (Coroir noir, Chancellor, Cab franc, and Pinot noir grapes) are in future production. Abundant in minerals, this special soil gives our wines beautiful rich colors and intense fruity flavors and aromas. Grace Vineyards, in nearby Russell County, is our second vineyard at a lower elevation which helps us hedge our bets against late spring frost. Grace Vineyards is home to our Chambourcin, Seyval Blanc and Vidal Blanc grapes. All the grapes are hand pruned and grown in the cool mountain air with lots of sunlight, then harvested and sorted by hand so that only the best grapes are used in our wines. David carefully trains or supervises the training of the vines himself to be assured of the greatest quality wine grape. Vines are trained on several different trellising systems to improve the wine quality of that specific variety by maximizing the sunlight to each cluster. The reclaimed mine land with its rocky soil and minerals increases the complexity of the fruit flavors at harvest. The vineyard’s elevation creates a mezoclimate in Southwestern Virginia with warm days and cool nights making our wines different from other wines in Virginia with more mouthwatering aromas and fruitier flavors. Fall in the Mountains is the perfect climate for ripening grapes with bright sunny days and cooler night temperatures.Springtime here is very challenging with the possibility of a late frost always possible. Varieties we grow need to be later bud breaking which limits us to some varietals and some French-American hybrids. A frost protection system of water sprinklers helps us with the spring frosts. Our winemaker is famous for saying that your wines are only as good as the grapes that go into them. Great fruit doesn’t insure good wine but grapes less than their best make it impossible to make a great wine. This philosophy means that we spend a lot of our time researching and implementing new practices in the vineyards. Visitors to the winery are often amazed at the beauty of the vineyard. The many shrub and antique roses, and the quiet beauty of the vineyard reflected in the pond is serene, but they love the story of how we recreated something beautiful and alive from the old mined land! In this age of “going green” or environmentally conscious, the vineyard is an excellent example of reclamation. 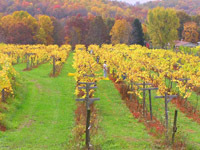 Environmentally sustainable practices, such as planting Caliente Mustard to kill nematodes instead of poisonous gases, are used in the vineyard. 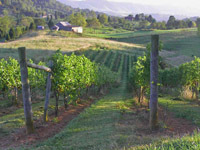 Come and visit us, tour the vineyards and taste our wines in the breathtaking beauty of the Southwest Virginia Mountains. We offer tours, tastings, parties, and special events 6 days a week and are always here just waiting for you!